The Vancouver Fraser Port Authority has a noise monitoring program to better understand the source and intensity of port-related noises and help respond to community concerns regarding noise. In the spring of 2013, the port authority contracted with EMS Brüel & Kjær to deploy and maintain a series of permanent noise monitoring terminals along the north and south shores of Burrard Inlet. In late 2014 and early 2015, additional noise monitoring terminals were deployed at Roberts Bank. We now have 11 long-term noise monitoring stations in locations across the port. 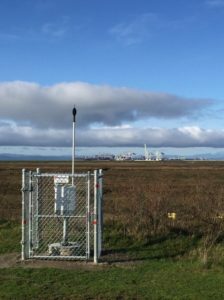 Monitoring is one of the ways the port authority is working with port users to minimize noise and other nuisances originating from federal lands and waters that it manages. Actively monitoring, observing, and reporting on noise trends increases understanding of concerns and highlights the importance of considering noise impacts in policy and planning decisions. Our port city can be noisy – car and truck traffic, construction, train whistles. Port operations are industrial by nature and some of our terminals operate 24/7. 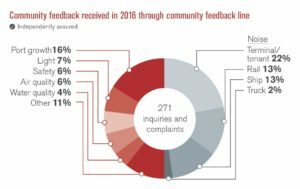 Local communities have raised concerns regarding impacts associated with port activities, such as ship engines and railcar movements, as well as warning signals and safety alarms designed to keep workers safe. Unfortunately, all of that noise can affect the quality of life for our neighbouring communities, particularly as our region grows. The Port of Vancouver, along with most urban activities, cannot operate effectively without generating noise. However, we are working with terminals, trucks, rail, and vessels operators to reduce noise from routine operations, as well as mitigate or avoid other noise sources, when it is safe and practical to do so. Are the noise levels getting louder or quieter over time? What are the nighttime noise trends? In general noise levels remain stable, neither materially increasing nor decreasing over the long term. Each area experiences a different noise environment that reflects the makeup of dominant sources (e.g. bulk, grain, and container terminals, dominance of rail and truck supply chains, and relative proximity to port operations). Our summary reports provide in-depth analysis and details of the three trade areas and individual noise monitoring locations. The noise monitoring terminals are fully contained, include a microphone to measure and record sound, and are connected to a secure wireless network to transmit data in real time. As weather influences how sound travels through the atmosphere, some terminals are also equipped with a weather station to capture wind speed, direction, humidity, temperature and precipitation. Data is streamed 24 hours a day, seven days a week and managed through the EMS Brüel & Kjær Noise SentinelTM application. Real-time noise data is available to the public via the port authority website and mobile app.